Enforce text formatting and rulers for your footnotes and endnotes using Nisus Writer's easy-to-use style system, ensuring consistency for all your notes. Endnotes can be placed at the end of the document, or at the end of each section. A single note can span multiple pages, as limited by customizable multi-page thresholds. 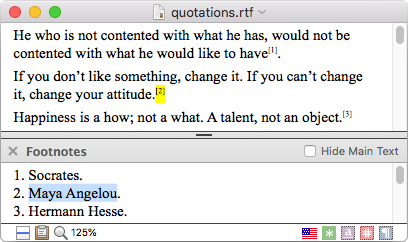 Nisus Writer's note styles allow you to control all aspects of your note references. Choose not only the reference sequence format (1, 2, 3... a, b, c... etc), but also any text included before and after each automatic reference. Separate character styles control the formatting applied to each note reference, allowing you to customize the formatting applied to references in both the main document text and note content areas. Note references may be customized individually too. Footnotes in your document may number automatically as ①, ②, ③... but perhaps you want a single certain footnote to use a custom reference symbol of †. Footnotes and endnotes appear in Page View in their expected locations — the bottom of the page, the end of each section, or end of the document — live while editing. You may however discover it's more efficient to edit notes in our dedicated Notes View, or using the new split view feature to edit your notes alongside the main document text in Draft View. Synchronized scrolling ensures related content is kept in view as you edit. Customize the appearance of the divider line that appears above note areas. Read more in our user guide's help topic about Footnote and Endnotes.